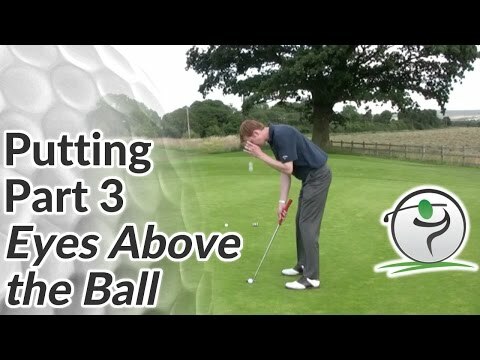 Putting Tips – Golf lesson and golf tips on the importance of keeping your head still when putting. In this golf putting lesson we will look at positioning your front eye (left eye for right handed golfers) naturally over the top of the golf ball. Doing this will allow for a couple of things. If you are to turn your head at address you will be looking right down over the putting line. This will allow you to read greens better, to judge the pace better, and will make it easier for you to confirm that the club is going through the ball on a straight line. If you are too far away from the ball, you will find it difficult to align correctly. Conversely, if you are too close to the ball, you will find it difficult to look over the line of the putt. A way to check if you are setting up correctly over the ball during your putting setup is to pull a ball from your pocket while you are set up and drop that ball from your left eye. If you are correctly over the ball, the ball you are dropping should land on the ball that was already on the ground.